The first day I flipped through Mark Bittman's How to Cook Everything I noticed it. Crackers. As in, make your own. I've been meaning to try since, oh, 2002? And I did it tonight. To OK results. What did you expect? Success on the first try? Remember who you're reading here, people. Now, I know home bakers everywhere are having a good chortle at my expense. All this fuss because she mixed flour and butter and milk and made her own crackers? I might as well be patting myself on the back for successfully making ice cubes. But once again I have to point with exasperation to from whence I came. I didn't know there was any kind of cheese apart from American Kraft singles until I was 16. I ate rice out of a box. and made PB&J's out of Wonder Bread, Peter Pan peanut butter and diet Smucker's jam. So it's not so much the cracker itself as it is the notion of making your own. It's like rediscovering the wheel. My God, you can make that stuff in your own kitchen? Think of the possibilities! Bittman says it's easy, and dog gonnit if he ain't right. Here's the recipe. It took all of 10 minutes to mix and 10 minutes to bake. Of course, being the Bad Home Cook, I didn't read all the instructions before starting, and so when I substituted milk for water, I didn't notice that I was supposed to up the butter to four tablespoons, but whatever. 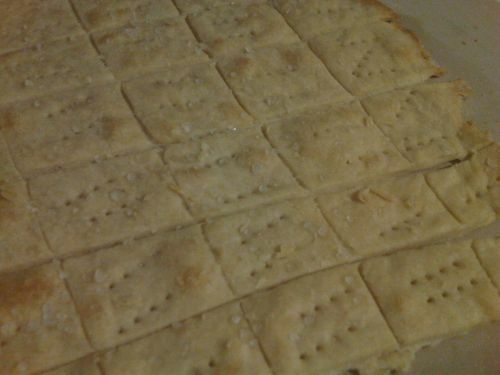 The result was still fresh, crackers, ready for avacado spread and what not. At least I had the foresight to season expertly with sea salt. Anyway, this was a lot of fun, and really so simple I can try it again and again and again until I master the finer points. That and pilfer some kitchen herbs to try and incorporate. Wonder what lemon zest would do in a cracker? Note to self, though: Next time, remove the turquoise ring first. Hard to pick cracker dough out with a tootpick. Hey, I’ve never really seriously considered making homemade crackers and I’ve been using Bittman’s book for over ten years. Thanks for the motivation and letting me know it’s easy! I thought we baked them at 350. Don’t we cook everything at 350? I do anyway, instructions be damned! I tried this recipe and though they tasted OK, they weren’t very crackery – no crunch! Not sure what I did wrong. ABS: that’s because I botched them, typically. There’s more butter involved if you’re gonna use milk. If you email me directly I’ll send you the exact recipe from Bittman. They definitely have potential!